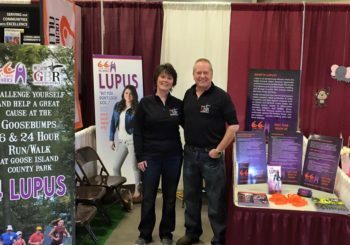 The Local Lupus Alliance continues to work hard to get the word out about Lupus as well as let the public know we are here to help for those suffering from this terrible illness. April was a busy month with the Coulee Parenting Connection Family Fun Expo April 3rd at the Onalaska, WI Omni Center, Family Fun Expo with approx. 4,000 in attendance, and the Viterbo University Health Expo April 12th, at the Mathy Building in La Crosse WI. The LLA had booths at each event, where we had the pleasure of speaking with visitors and attendees. We met many people who had loved ones, friends and family, who had active lupus or had passed away from complications caused by lupus. We shared information about our upcoming fundraising events, as well as handed out business cards and brochures about our organization. July 30th, 2016 the LLA will have a booth for the Gundersen Health System Wellness Fest, at the La Crosse Center. Pictured are LLA Board Vice President, Deb Brazil with her husband Paul Brazil. Also working the booths were LLA Executive Director, Richard Chrz and his wife and LLA Board member Renee Chrz.